(TriceEdneyWire.com/Global Information Network) – In a surprise upset for incumbent President John Dramani Mahama, voters turned out strongly for opposition candidate Nana Akufo-Addo, whose campaign for the presidency gave hope to thousands of jobless Ghanaians. Mr. Akufo-Addo earned 54% of the vote, while Mr Mahama took 44 percent. It was the first time in Ghana that an opposition candidate defeated an incumbent President at the ballot box. “There must be jobs in our country,” Mr. Akufo-Addo declared. “That means big investments in viable industries and boosting our agriculture productivity,” adding that he was also committed to delivering on a pledge, made five years ago, to ensure that all Ghanaians would have access to free secondary education. Ghana’s underemployment rate is 33 percent with 69 percent of the working population in low wage, insecure and informal jobs, according to the online news site Ghanaweb. Unemployment is also higher among women, according to the Bank. Agriculture, the backbone of Ghana’s economy, recorded the lowest average growth rate at 3.9 per cent annually over a period of two decades from 1993 to 2013. In a move to build back industry, Mr. Akufo-Addo pledged to build one factory in each of Ghana’s 216 districts. He pledged to build a dam in every village to support agriculture. Along with jobs, the president-elect promised to attack corruption with the appointment of an independent prosecutor. Last year, Transparency International ranked Ghana as second most corrupt African country, after South Africa. The president-elect will be sworn in on Jan. 7 after a short transition period. 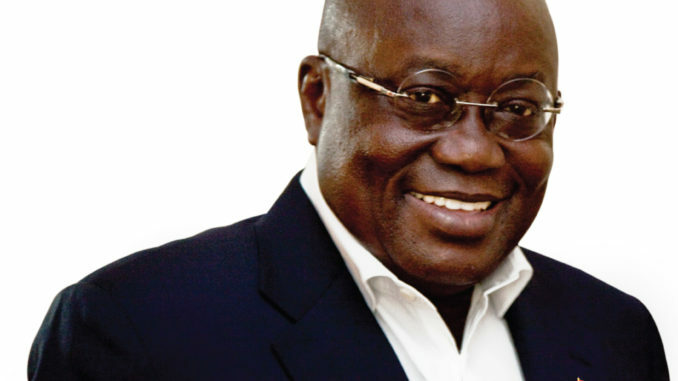 Mr. Akufo-Addo comes from a prominent Ghanaian royal and political family. His father was a Chief Justice, President of Ghana (1970-1972) and member of the “Big Six” who, along with Kwame Nkrumah, spearheaded the transition from colony to independence. His maternal grandfather was Nana Sir Ofori Atta, King of Akyem Abuakwa, one of the largest and wealthiest kingdoms of the then Gold Coast Colony. The president-elect’s own political career spans more than four decades. Active in political movements in his early 30s, he criticized the military government of the time.